The 7,500-ton stealth guided missile destroyer is New Delhi’s latest addition to its burgeoning naval arsenal. 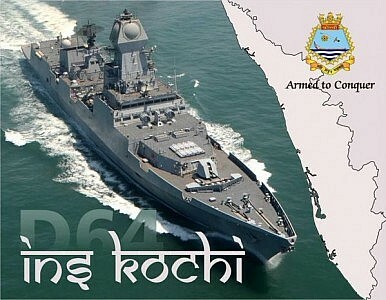 On Wednesday, Indian Defense Minister Manohar Parrikar commissioned the stealth guided missile destroyer INS Kochi at a ceremony held at the Mazagon naval dockyards in Mumbai, The Hindu reports. The INS Kochi is the second in a series of three planned Kolkata-class (Project 15A) destroyers of the Indian Navy. The destroyers are designed to be multi-mission ships capable of engaging in anti-submarine/anti-ship warfare, land attacks, and air defense. Given their multi-purpose role, the destroyers are ideally suited for supporting expeditionary and surface strike groups. The ship incorporates new design concepts for improved survivability, stealth, seakeeping and maneuverability. (…)Enhanced stealth features have been achieved through shaping of hull and use of radar-transparent deck fittings. A bow mounted sonar dome, the second of its kind in an indigenous naval platform, has been introduced to enhance sonar acoustic performance. With a crew of 325 and powered by four gas turbines, the 7,500-ton vessel boasts a speed in excess of 30 knots and has a range of approximately 8,000 nautical miles (15,000 kilometers, 9,200 miles). The ship’s armament consists of a 76mm Super Rapid Gun Mount, a fully-automated Russian AK-630 close-in weapon system, and RBU-6000 rocket launchers, as well as indigenous twin-tube torpedo launchers. The vessel also can carry up to 32 Barak-8/NGs — an Indo-Israeli surface-to-air missile (SAM) jointly developed by Rafael-IAI and India’s Defense Research and Development Organization (DRDO). The INS Kochi also boasts a large flight deck and can carry two multiple-role aircraft (e.g., Sea King or HAL Dhruv helicopters). The lead ship of the Kolkata-class, the INS Kolkata, was commissioned back in August 2014 after a four-year delay caused by repeated design changes, supply chain interruptions, and technical problems during sea trials. The third and final vessel, the INS Chennai, is slated for induction at the end of 2016. The INS Kochi is the tenth destroyer commissioned into the Indian Navy.